Rabbit Rhythm Newsletter #015 - Chicken Police keep rabbits in line! It's May. Spring is in full swing and rabbits are everywhere. So perhaps unsurprisingly, we received an emailed request last Sunday from a local family. "We’d like to get a bunny for Easter," read the email. "Both my husband and I had bunnies as kids, and we think we’re ready to get a pet bunny as a family." That very afternoon they stopped by to check out our bunnies. I was delighted to meet them - a young Coast Guard family driving a Honda with Wisconsin plates and carrying a cell phone with a Rhode Island phone number. On one arm was a 14-month-old toddler girl. From the looks of things, however, we think the little girl will definitely enjoy growing up with the bunny - she was delighted with everything in the barn, and especially with the bunnies. We think the Easter season is as good a time to acquire a bunny as any other time. Any time anyone takes on responsibility for a living animal - dog, cat, rabbit, hamster, goldfish, whatever - there will be ongoing animal care involved, usually every day and possibly for years. Get an Easter bunny, by all means, if that is what you’d like to do. Daily chores are good for you - they develop character. And lest you fear that a rash of Easter bunny sales will lead to a rash of abandoned lagomorphs, we offer you a very well-written and researched opinion about rabbit overpopulation...we completely concur. 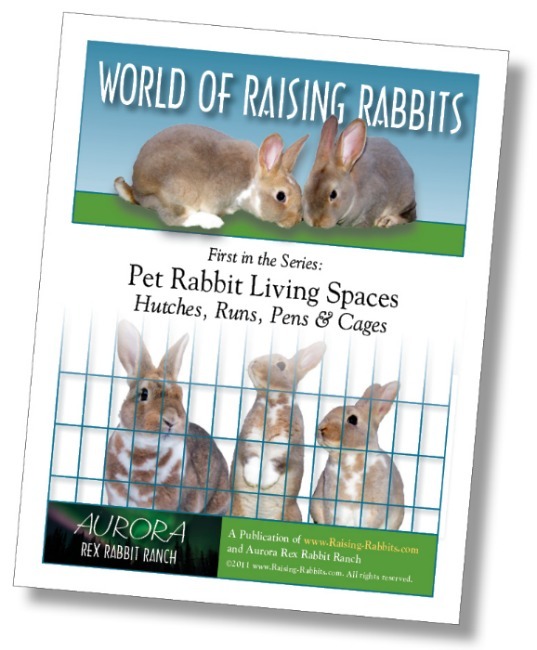 As you know, Raising-Rabbits has issued the first e-book of their World of Raising-Rabbits e-series. Visit Build Your Own Rabbit Cage for the entire low-down on Pet Rabbit Living Spaces, where we give you all of our state-of-the-art rabbit cage and hutch frame designs for your pet rabbits living both inside and outside the home. The low introductory price of $4.99 will expire soon. Gotta say though, the regular price of $5.99 is still so low that anyone can afford it. You have until April 23, 2011 to snag your copy at the rock-bottom price. Hurry over and purchase your copy today! E-Book #2 is entitled DIY Livestock Rabbit Housing and will provide exceptional housing plans and ideas for anyone raising show rabbits or meat rabbits. These plans would also be ideal for pet owners of more than 4-5 pet rabbits. Expect DIY Livestock Rabbit Housing to become available by May 1! When it does, you'll find our announcement on our Rabbit Cage page. The other day I picked up one of our rabbits. I held her close and petted her, rubbing her head and ears, and stroking her over her back. 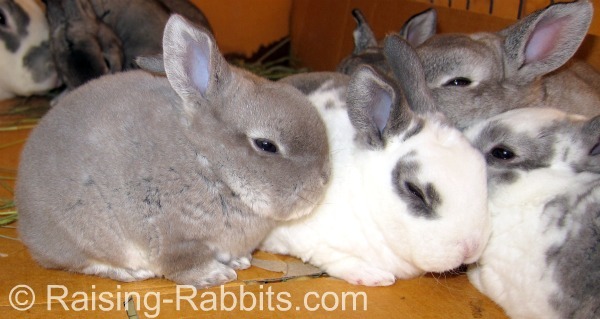 (Rex rabbits are like that...difficult to stop holding and petting because they're so...mmmm - plush!) As I did so, I felt something like scabby lumps in the triangle just behind her ears. Further investigation revealed fur mites. Fur mites (Cheyletiella parasitovorax) are non-burrowing little parasites that like to chew on your rabbit's fur and skin. Feeling those little scabby lumps where you should be feeling smooth fur is sometimes the first clue to their presence. The incidence of fur mites rises in the spring as the weather begins to warm up. Rabbits with weaker immune systems are more likely to suffer an infestation (hmm, that's my clue to keep a close eye on my doe! ), while some very healthy rabbits can carry fur mites and show no symptoms at all. Mites are itchy to the rabbit, apparently. As the rabbit scratches her neck, she might nick her skin and draw a little blood. Plus, the tiny skin bites release bits of serum. I was feeling all of that. Severe infestations cause dandruff, seborrheic lesions, and fur loss. You'll typically see bare spots, or a triangle of short new fur behind the ears continually trying to grow in. Where did they come from? I'm fairly sure our rabbits have been free of mites entirely. But we do attend rabbit shows now and again, so our doe may have picked them up from other rabbits or from the new environment. A second dusting 10 days later is very important in order to kill newly hatched mites. The two treatments should solve the infestation. Be sure to recheck your animal after a few weeks, to ensure the mites are gone. Also check any other rabbits that live with or near an infested rabbit, and treat as necessary. See Rabbit Parasites for more info on fur mites and other common rabbit parasites. Ever hear of the Chicken Police...? !